1 of 3 Sift together flour, sugar, cocoa powder and salt into large bowl. Using pastry blender, cut in butter until mixture looks like coarse cornmeal. Sprinkle espresso powder over the cold water in small bowl. Lightly beat in egg yolks and vanilla. Using a fork, stir egg mixture into flour mixture until dough comes together. Shape into disk; wrap in plastic wrap. Refrigerate overnight or up to 2 days. 2 of 3 Heat oven to 400 degrees F. Working with half the dough at a time, roll out between 2 sheets of parchment or waxed paper to 3/16-inch thickness. Remove top sheet of paper. Using 3-inch-round biscuit cutter with fluted or scalloped edge, dip edge in flour and cut out as many cookies as possible. leaving cookies on paper. Slide cookies on paper onto baking sheet. Freeze 10 minutes. Use a small metal spatula dipped in flour to remove the cookies from the paper to clean baking sheets. Gather the scraps together; re-roll; cut out additional cookies as above and place on baking sheets. You will need a total of 21 cookies. 3 of 3 Bake in 400 degrees F oven 8 to 10 minutes. Let cool on baking sheets on wire racks 2 minutes. Remove from sheets to rack to cool completely. 1 of 6 Combine milk and 2 tablespoons sugar in medium-size saucepan. Scrape seeds from vanilla bean into milk mixture; add bean. Bring to a boil over medium heat. Remove from heat. Let steep 15 minutes. Remove bean and discard. 2 of 6 Whisk together egg yolks and 2 tablespoons sugar in medium-size bowl until lemon colored and smooth. Sift in flour and cornstarch; whisk until smooth. 3 of 6 Whisk 1/2 cup hot milk mixture into egg mixture. Pour egg mixture into milk in saucepan. Bring to a boil, stirring constantly; mixture will be consistency of sour cream. Boil 2 minutes, stirring. Remove from heat. 4 of 6 Meanwhile, sprinkle gelatin over liqueur in small measuring cup. Let stand 5 minutes for gelatin to soften. Bring small saucepan of water to boiling. Place measuring cup in water; stir gelatin mixture to dissolve gelatin. Stir into egg mixture. Pour into bowl, straining if necessary to remove any lumps. Place bowl in ice-water bath 5 minutes, until cooled and slightly thickened, stirring occasionally. 5 of 6 Beat together heavy cream and 3 tablespoons sugar in medium-sized bowl until stiff peaks form. Stir about 1/4 whipped cream mixture into egg mixture. 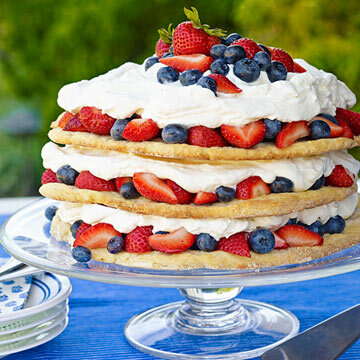 Gently fold in remaining whipped cream. Place plastic wrap directly on surface. Refrigerate until completely cooled and thickened, about 1 hour. 6 of 6 Place a cookie on individual plate. Spoon filling into pastry bag fitted with large star tip. Pipe a generous 1/4 cup onto cookie. Top with about 6 cherry halves. Place a second cookie on top; pipe another layer of filling; top with 6 more cherry halves. place another cookie on top. Repeat with remaining cookies, filling and halved cherries (total of 7 stacks, 3 cookies per stack). 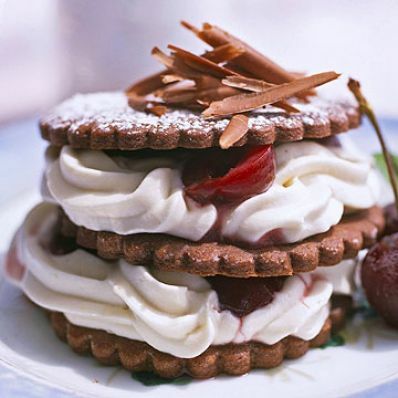 1 of 1 Dust each stack with confectioner's sugar and top with shaved chocolate and cherries.